"I had a dream/In which I killed/All of my friends". Whoa, I thought and 'Where were you when we lost the twins" followed straight after. The opening line from David Ramirez' latest album was what I associated with immediately. Some kind of an opening statement by Astral Swans or Canadian singer/songwriter Matthew Swann, as his parents called him at birth. A lyric that make my hairs stand on edge. What is to follow if someone starts his record like this. "They were unable to forgive (and forget)", so at least they are alive in the dream. Remorse and angst follow after awakening only to change to some more dreaming. The music is just as dark and haunted in 'Blow Away'. With a doo wop wop harmony vocal in the background as a sharp contrast to it all. Oh yes, I am intrigued by Astral Swans in this opening song. Not just by the lyric. It is the way the song is built up, with a subtle guitar lick, very elementary yet 100% effective. The thin organ playing the full chords and the soft drumming and bass playing. 'Blow away' gets the exact right pace for a song about the fear of being found out for thoughts and dreams. The opening song sets the mood for Strange Prison, an album full of songs that "are character studies in the complexity of being human". I am hardly ever one for lyrics, but I notice how they are one with the music Astral Swans makes and not something that is laid over the music. The way of singing sets the mood and the music reflects the darkness and hesitation. In that pool small little things take place that make little parts of that darkness shine. It does not have to be more than a few bright keyboard notes like in 'What Are You Gonna Do With Yourself'. By now it's clear for all that Strange Prison is not an album one takes along to a party. It is an album to hide away with, to seclude oneself from the world and totally emerge into it. Preferably with a headphone on and the world shut out for a while. 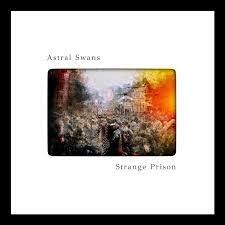 Slowly but surely Astral Swans will draw you into its world and make it a little better along the way. Fellow Canadian Neil Young has made music as bare as this, as have many other singer-songwriters hiding from having to find a little blue on their hats. Trying to find answers to the big questions in life: Who am I and what am I here for? The inner soul searching for more answers. It is all reflected here on Strange Prison. With co-producers Scott Munro, Dan Mangan and Paul Chirka Matthew Swann has found the right sounds and minimal arrangements to accompany his songs. Yes, Strange Prison is an album that I have to be in the mood for, but I have found it is not hard for the album to bring me into that mood quickly. It seems like a win-win situation. From @AstralSwans: "This is a really beautiful review. Thank you :)"